Fish Plant; 1,000 lbs of Trout were planted at the Boat Launch by the Department of Fish and Wildlife on 54548. 1,200 of Mt Lassen Trout were planted at the Marina on 5-17-18. Aaron Baba of El Sobrante caught a bass using a kast master on the main rec shoreline on 5-15- 18. Matt Mira Bella of Novato caught 4 trout the largest weighing Slbs using a brown rubber worm and garlic power bait at gazebo 1 on 5-1648. Glenn and Loren of Novato and Corte Madera caught a couple of trout in a secret spot on 5-19¬18. Manuel and Alfredo of Pinole caught 10 trout using power-bait in Scow Canyon on 5-20-18. 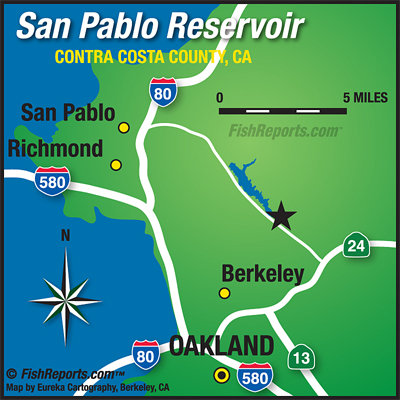 San Pablo Recreation area is open daily the month of May from 6:00am — 7:30 p.m. Boats having to be off the water at 6:30 p.m. The café is open, Saturday & Sunday from 10am to 4 pm.